Last night's segment of the Rachel Maddow show provided footage, which first appeared at Talk To Action, of a Christian evangelist who is quite influential but also little known to secular Americans: Lou Engle, founder of TheCall. The Maddow segment highlighted an event noted a few days ago by RightWingWatch, an anti-health care reform "Prayercast," held by the Family Research Council, led by emergent, highly militant leaders of the Christian right such as Lou Engle and also by Republican senators Brownback and DeMint, and GOP Representatives Bachmann and Forbes. The GOP fab-four has scored a trifecta - Lou Engle is opposed to health care reform and legal abortion, and his organization TheCall played a major, if little noticed, role in passing California's Proposition 8. A 2002 study of the influence of the Christian right within the GOP indicated the movement exerted strong to moderate influence in a majority of state Republican Party structures. Over the current decade the Christian right has gone on to become dominated by a tendency that, during the 1990's, was associated with domestic terrorism. In 2009, top captains of the GOP now pay obeisance to radical Christian leaders who appear to advocate acts of Christian martyrdom, which some might call terrorism, to stop gay marriage and legal abortion. Engle, who has publicly called for acts of Christian martyrdom, could be found last summer blessing and anointing Newt Gingrich and Mike Huckabee at a Virginia Beach megachurch. Engle represents a religious right tendency that had become so dominant that known potentates such as James Dobson and Tony Perkins travel to Engle's TheCall events - such as the San Diego stadium rally which served as the capstone to the successful anti-gay marriage Proposition Eight push in California. Engle's religious movement has also played a significant role in inspiring, and even organizing, legislators who pushed the pending, draconian anti-gay legislation in Uganda that some have described as a "kill the gays" bill. "Right now they haven't seen the true church. There's an underground church that the world has no idea that exists. Once they get the stage, it's over with." While the American left has heavily focused on the Tea Party movement, leaders in Engle's arising tendency, which I've described as the The Rainbow Right, wield major electoral influence with minority groups and can infiltrate Washington-based Democrat "centrist","common ground" efforts with ease. Four of the Christian leaders appearing in the "PrayerCast" event alongside Brownback and DeMint played dominant roles in a two and a half hour, key motivational and planning conference call, held July 30th, 2008, for leaders of the Christian right who organized the successful campaign to block gay marriage in Arizona, Florida, and California. Those leaders are: Jim Garlow, Bishop Harry Jackson, Tony Perkins of the Family Research Council, and Lou Engle of TheCall. 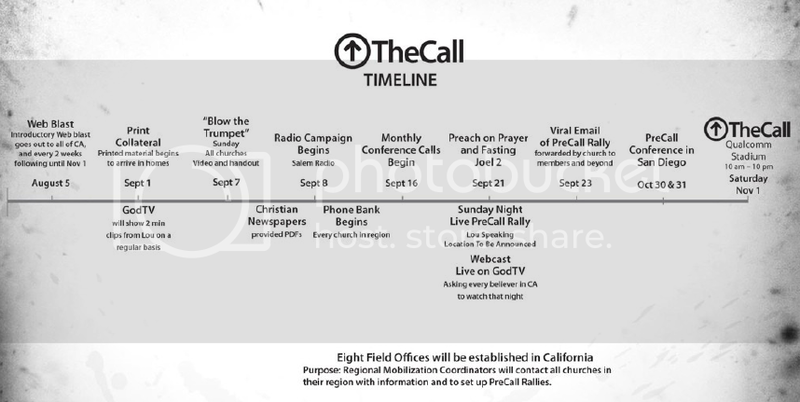 Engle's operation was so central to the California pro-Prop 8 drive that one of the four campaign timeline maps, distributed to members of that July 30th, 2008 conference call detailing major elements and events for the anti-gay marriage campaigns in AZ, FL, and CA, was dedicated solely to TheCall's effort in California. Founder of TheCall Lou Engle has predicted that legal abortion will lead to a second civil war. And, as I've previously noted, the runaway hit documentary Jesus Camp, by Heidi Ewing and Rachel Grady, featured footage of an Engle appearance at Becky Fischer's former summer camp for Christian children. In Jesus Camp Fischer states her desire to indoctrinate children to be as dedicated as Hamas suicide bombers [ see here for relevant footage of Engle at TheCall and Fischer, from Jesus Camp ]. Lou Engle's son Jess Engle specializes in casting out gay "demons" and has established a ministry in San Fransisco, which Lou Engle has described as a place "where the homosexuals boast the dominion of darkness." In the early 1980's, KKK and Aryan Nations strategist Louis Beam helped popularize a tactic known as "leaderless resistance" in which high profile propagandists would incite terrorist acts carried out by autonomous individuals and cell groups. During the 1990's leaders of the Army of God, wielding militant anti-abortion rhetoric, helped inspire terrorist bombings of abortion clinics and the assassination of doctors who provided abortions. Now, a decade later, one can hear such incitement coming from the stage at Lou Engle's TheCall events, which Engle's group holds in stadiums not just in the United States but around the world too, in Australia, Germany, the Philippines, Norway, England, Jerusalem and Brazil. Over the last two decades, the American Christian right has gone truly global and established power centers in the developing world which now lend support to the long march, in the United States, towards extending Christian dominion over key sectors of society such as government, business and finance, education, media, and religion. Engle's role as leader of TheCall has now received some mainstream media notice but the source of his influence is still largely unknown. Lou Engle serves, alongside Sarah Palin's prayer group leader Mary Glazier, on the Apostolic Council of Prophetic Elders, one of the key leadership groups wielding influence over a sprawling, global new incarnation of the religious right known as the New Apostolic Reformation. As detailed in a recent Talk To Action report, Peter Wagner's New Apostolic Reformation has played a major role in inspiring and organizing Ugandan legislators behind the draconian "kill the gays" bill before Uganda's parliament. Are you and Peter Wagner attempting to rid the world of homosexuals? Absolutely not. Peter Wagner was a seminary professor of mine, but not my doctoral dissertation advisor. I have not had contact with Peter Wagner for many years and am certainly not conspiring with him for any purpose. Additionally, the event chronicled at Angels Stadium in 2005 has been grossly misrepresented. I was simply arguing that Christians could have a tremendous effect for good in the world if they had the same dedication as the followers of Mao. I would never argue that anyone should emulate or espouse the views of Mao, Hitler or Lenin.